We are a granola family for sure. Everyone from Dad to 2-year-old Maria loves granola - on top of plain yogurt in the morning, mixed in with açai after a couple hours on the beach, or even just as a little snack while watching a movie. Homemade snacks are always a win, and granola is a a great homemade snack, easy to make with your kids. I find that buying my own ingredients and making granola at home is always more cost efficient than buying from the store. Not to mention how so much of store bought granola is loaded with sugar, additives, and sometimes even high fructose corn syrup. My husband is the baker in the family and he was always experimenting with different granola recipes, modifying here and there until he created his granola masterpiece. 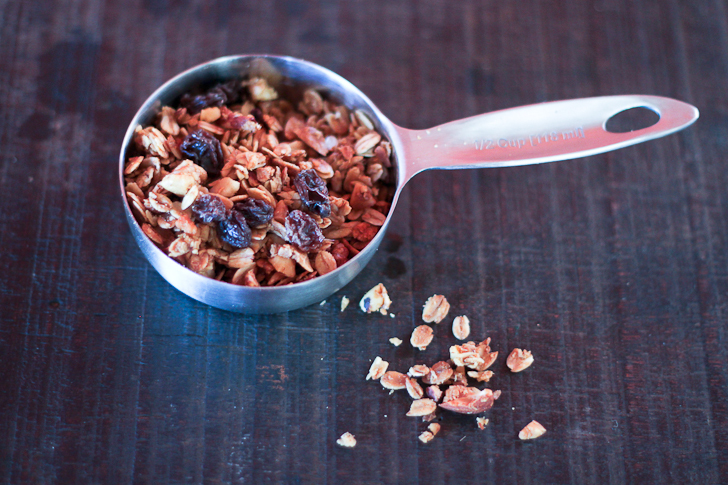 Making granola at home is easy, the only hard part is making sure that the granola doesn't burn. 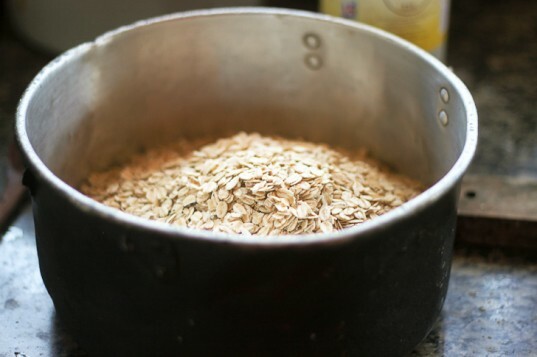 This recipe that I'm going to share does a good job at making sure the granola is moist before putting it in the oven, and if you check on the granola every 10 minutes while it's baking you'll prevent it from burning. I promise you, you'll have a hard time going back to the store bought kind. And if I need to convince you further then think about all of the homemade jam and marmalade that's gifted as holiday presents in glass jars this time of year. 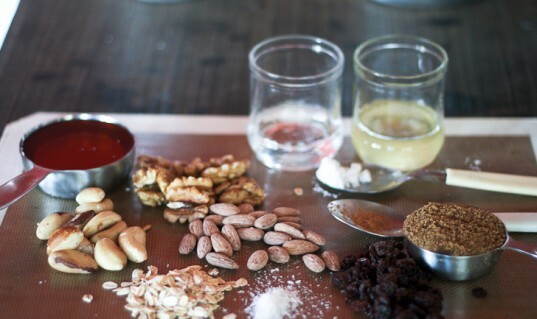 Well, homemade granola also looks cute in a glass jar and can be a great holiday gift. 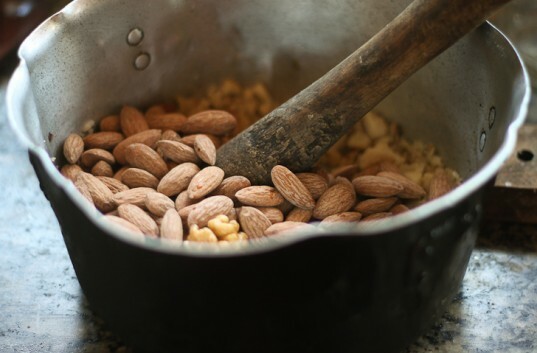 Add the nuts to a large mixing bowl or large pan. 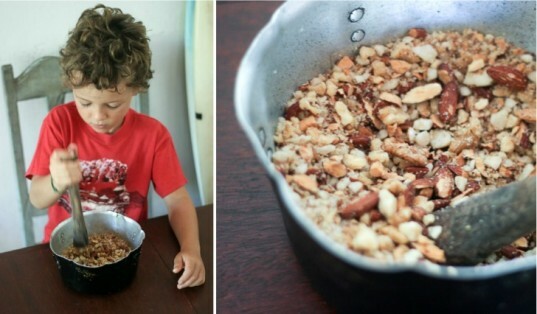 I like to use a mortar to chop up the nuts, that way my 5 year old can help and I have greater control of how big or small I want to keep the nuts. If you have a food processor and would rather use that go for it, just be careful to not pulverize the nuts, try to keep them at least pea sized. Add the oatmeal, cinnamon, and salt, to the chopped nuts and mix with your hands. 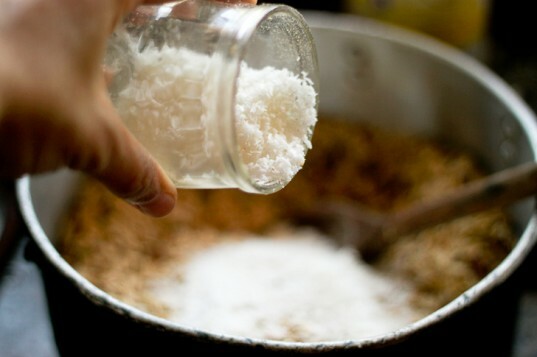 Add the dehydrated coconut and mix with the other dry ingredients. Turn the oven to 325*F to preheat. Then in a small sauce pan add the water, honey, coconut oil, and brown sugar. Heat on medium-low stirring constantly until it comes to a boil. 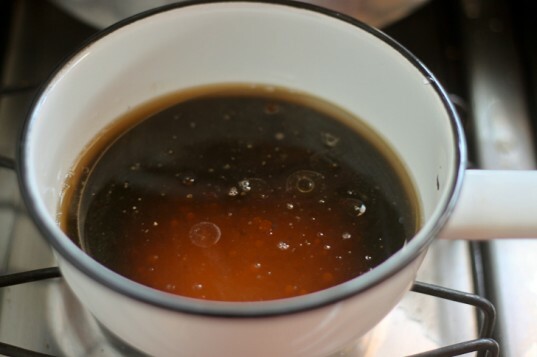 Pour the syrup over the dry ingredients and mix well until everything is evenly coated. 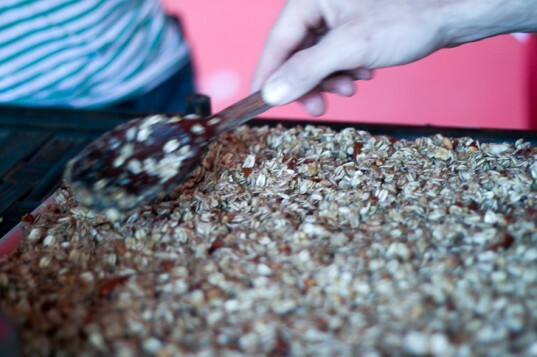 Pour half of the granola in a greased cookie sheet and spread it out as evenly as you can. Bake for about 30 minutes, mixing every 10 minutes. 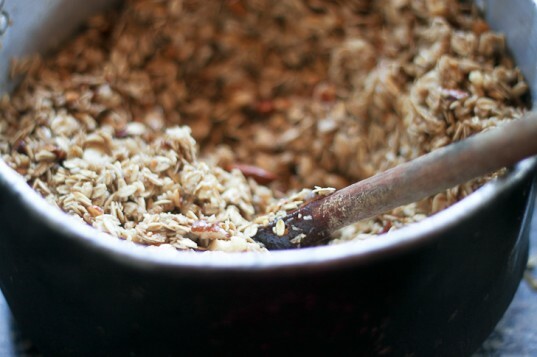 This is the most important step because this is where granola often goes wrong. Once you pull it out it will still be soft and will gradually get crunchier as it cools. I like to take it out a little early so that it never gets too crunchy. Let the granola cool down for 10 minutes then put in a large bowl. Repeat with the second batch. After the second batch is done add the raisins and gently mix with the rest of the granola. This recipe yields 10 cups of granola. 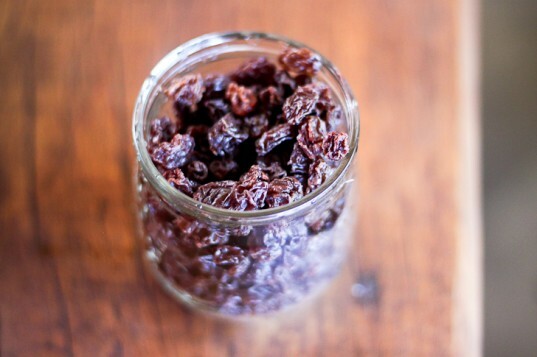 To keep it fresh, store it in glass jars at room temperature or put it in a freezer bag and freeze until ready to be used. 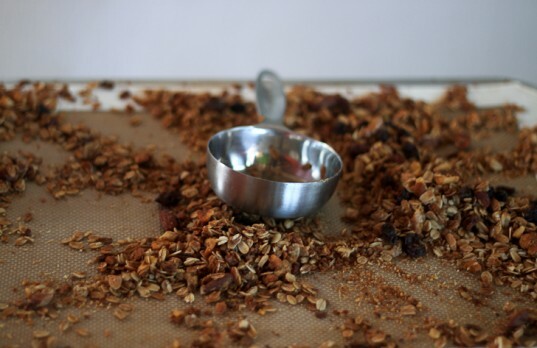 The granola stays fresh for at least a month if kept in an air tight container.